Silverstone declares itself the home of British racing and with a history stretching back to 1948, there is some justification to the claim. Always one of the fastest circuits, Silverstone has developed from its windswept airfield origins into one of the most recognized in world motorsport. By the following year, there was official interest in creating a circuit from the runways. With Donington Park being used as a storage area for the military, Brooklands being owned by Vickers Armstrong with its inevitable focus on aircraft and Crystal Palace in a state of disrepair, the Royal Automobile Club began searching for new venues. With its expanse of runways and perimeter roads, Silverstone seemed ideal. In what would turn out to be one of best decisions in motor racing administration history, the RAC enlisted James 'Jimmy' Brown to organize the first Grand Prix, giving him less than two months to make the event a reality. Not only did he pull off a minor miracle, Brown remained firmly at the helm for nearly 40 years, guiding Silverstone's transformation from austerity to world-class facility. The event, nonetheless, was deemed a success and set Silverstone firmly on the motor racing map. From 1949, a switch to the perimeter roads only was made, albeit with a chicane at Club Corner initially. The pit facilities were located between Abbey and Woodcote. Significantly, Silverstone was the venue of the first Formula One World Championship event, in May 1950. The Queen was in attendance – to date the only British event at which a reigning monarch has been in attendance – to watch Dr Giuseppe Farina win for Alfa Romeo. The early years also saw a shorter 'Club' circuit introduced for a number of national events for the first time. The Vintage Sports Car Club used this variant in 1949, which ran from Copse, through Maggots, Becketts and Chapel down to a hairpin and Stowe and along the runway back to Copse. The start/finish was just after the Stowe hairpin, the course being run in a clockwise direction. From 1952, the British Racing Drivers' Club took over the running of the circuit from the RAC and a number of corners saw minor revisions and other facilities were generally improved. The pits and paddock assumed their familiar location between Woodcote and Copse, the start/finish line also moving to this new location accordingly. The classic Silverstone layout was now firmly established, complete with a new Club Course which ran through Copse and Maggotts before turning back on itself just ahead of Becketts and running along one of the runways back to Woodcote. Few significant circuit layout changes would occur for the next quarter century, although gradual improvements to pit and spectator facilities continued. In 1961 the BRDC acquired the lease to the agricultural land both within and around the circuit, increasing the opportunities for future development. After two accidents in the then 'open face' pit facilities, a new pit lane – separate from the main track and on an elevated platform – was built in 1964, greatly improving safety for competitors and their mechanics alike. The BRDC – boosted by the successfully revenues generated by the track - formed Silverstone Circuits Limited in 1966, to look after the circuit's commercial activities. Five years later, the Club purchased the freehold of the entire 720-acre estate from the Ministry of Defense. The 1973 British Grand Prix stands out as a significant event in Silverstone's history. At the end of the first lap, a youthful Jody Scheckter lost control of his McLaren at Woodcote, spinning into the pit wall. The chain reaction behind saw a mass pile up behind which took out most of the field and was, at the time, the biggest crash in F1 history. Amazingly, Andrea de Adamich was the only casualty, suffering serious injuries, which ultimately would end his driving career. The collision also exposed the fact that debris could end up in the grandstands and it was clear that changes were needed. The GP was held at Brands Hatch in 1974, but by the time the new season arrived in 1975, a chicane greeted the racers at Woodcote, as did brand new pit garages. 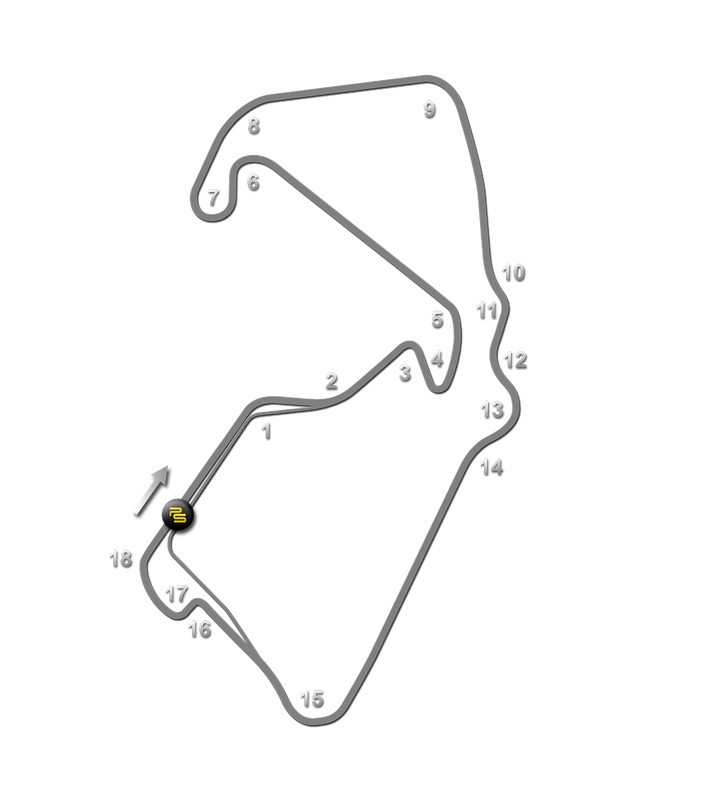 The national circuit continued to bypass the chicane, as did the motorcycle course. Abbey and Luffield - Luffield Abbey, the remains of which were discovered 200 meters from Stowe Corner. Becketts and Chapel Curve - the ruins of the Chapel of Thomas Becket lie close to the circuit (the BRDC changed the spelling for the corner name though!). Brooklands - the world's first purpose-built circuit at Weybridge, Surrey. Things came to a head in 1985, when Keke Rosberg set a 160mph average lap speed in qualifying (despite a slow puncture) and three other cars posted laps of more than 159mph. By the time the F1 stars arrived for 1987 - the race again skipping a year at Brands Hatch - dramatic changes had been made to Woodcote. The S-bend chicane was removed and replaced by a new sharp left-right bend on the approach. In addition, more than £1 million was spent replacing the 1975 pits with 40 much larger garages, topped by an all-new press center that would be completed by the 1988 Grand Prix. The changes also allowed the introduction of a longer 'National' course, which utilized a new right hand turn off the Club Straight (later named Brooklands) and right hander onto the chicane, forming what became known as the Luffield Complex. The Club circuit remained unchanged. Further significant redevelopment happened over the winter of 1990, designed to take the circuit through the 1990s. The run off at Copse was increased by tightening the entry and re-routing the corner, while the original Becketts corner was by passed with a sweeping – and high speed – series of corners forming a new Maggotts-Becketts-Chapel Curve sequence, which drew universal praise. Hangar Straight was unchanged, save for the addition of a traffic bridge, but Stowe was slowed and tightened into a fourth gear turn, before the track diverted off into the new Vale complex and a left-right flick back onto Club. The cars were, as a consequence, slower through an unchanged Abbey, before swooping under the bridge and right through a new high-speed corner, up to the left-hander at Priory and back onto the Brooklands/Luffield complex before Woodcote, minus the need for the chicane, completed the lap. Further track revisions came in 1994 after the deaths of Ayrton Senna and Roland Ratzenberger at Imola and a testing crash for Pedro Lamy at Silverstone saw a renewed focus on circuit safety. Copse was further re-aligned to increase run-off, while a new and slower Stowe was constructed. The entry to Club was also tightened and a new chicane inserted at Abbey. Priory corner was diverted, turning in earlier than previously and leading to a hairpin-like corner at Brooklands. A new South Course was created, running from Abbey back round to Chapel Curve, which could be run simultaneously with the National or Club circuits, though with no pit facilities to speak of was only used for school use or testing purposes. More alterations were made in 1996, when a better solution was found for Stowe Corner; by adding a gradual kink towards the end of the Hangar Straight and moving the track towards the infield, greater room was created for run-off and a faster Stowe could once again be restored. Another new addition at this part of the track was the self-contained Stowe circuit. Utilizing some of the original runways near to the Vale complex, the new triangular course offered excellent and safe facilities for the Silverstone Racing School. Also new was the International course. This turned right after Maggots, through a fast chicane at Ireland and onto the South course, before turning back on itself at Abbey through a 180 degree hairpin. It became one of the most-used circuits, with many national championships preferring it to the longer Grand Prix circuit. Further significant investments were brought forward a year when a new Priory/Brooklands/Luffield complex was unveiled. Much more satisfying to drive, its design featured input from the drivers themselves. A small change was made to the International course as well, when the Ireland chicane was bypassed (although motorcycle racers continued to use it). Infrastructure changes around the circuit improved access, with a four-lane entry road completed in 2002 as an ancillary project to the joining of the M1 and M40 motorways nearby. Thereafter the next significant changes came in 2003, this time at the behest of the World Superbike racers. Speeds through Woodcote proved a concern and a new tighter loop at Luffield and clumsy flip-flop chicane was inserted, which undoubtedly slowed speeds, but was never wildly popular. Uncertainty over the future of the Formula One race (which had flirted with plans to race first at a redeveloped Brands Hatch and then committed to Donington Park) led to Silverstone bosses begin to look elsewhere for its headline event. Plans to bring back the MotoGP racers for the first time since 1986 were hatched, and with it a much revised circuit. When Donington Park's F1 bid fell through in financial acrimony a new F1 deal was signed and the planned circuit works modified. To accommodate Bernie Ecclestone's demands, a new Wing-like pit and paddock complex was to be built between Copse and Abbey, with the circuit swooping infields to a new 'Arena' complex before rejoining the existing circuit on the former Club Straight, now renamed in honor of the Wellington bombers which once took off along it. The new course debuted in 2010, although work to complete the new pit complex was completed in time for the 2011 Grand Prix. This has led to the circuit having alternative start and finish locations – F1 uses the 'Wing' pits, while most other championships tend to use the original pits and start/finish locations. A new International circuit using the southern half of the Grand Prix circuit could now be used independently thanks to the Wing pits, it has yet to secure any major racing action, while the National circuit has gained greater prominence once again, especially as the venue for the annual rounds of the British Touring Car Championship. While the old track from through to Bridge and Priory still remains, circuit bosses officially decommissioned it in 2011 and it now forms a picnic area.